News & Stories > Blue Sky Science > What is a neutrino? 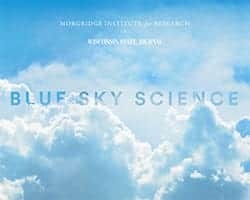 Blue Sky Science: What is a neutrino? In high school you learn that matter is made of atoms, atoms are made of electrons and nuclei, and nuclei contain neutrons and protons. That’s a basic picture of matter, but it’s an incomplete one. Missing in that picture is a full particle called neutrinos. Neutrinos are actually the most common particle of matter. They change neutrons into protons. Without neutrinos, the sun wouldn’t shine, stars wouldn’t explode, and all the stuff we are made of wouldn’t exist. So neutrinos are pretty important. Neutrinos don’t carry an electric charge and in this way are very similar to particles of light. But unlike light, neutrinos can go through walls. In fact, they can stream through the Earth or other planets, escape from black holes, and move through the whole universe. Light cannot do this. Astronomers can take pictures of the universe with all forms of light, different colors and different wavelengths. You can also take a picture of the universe, that would look very different, using neutrinos. Since neutrinos move through everything, it’s difficult to stop them, and therefore also very difficult to detect them. You need a huge detector. What we use at the IceCube South Pole Neutrino Observatory is a gigatron, a cubic kilometer of ice a mile deep under the South Pole. The detector actually is the ice itself, and it manages to stop neutrinos. When you go out at night and look at the sky, your eyes collect light beams, you see the stars, and you make a picture of your universe. IceCube is an eye, but instead of seeing light beams, it sees neutrino beams. Two years ago we actually saw neutrino beams from the universe. We are trying to figure out what the picture is telling us, and I have the feeling that we are almost there.